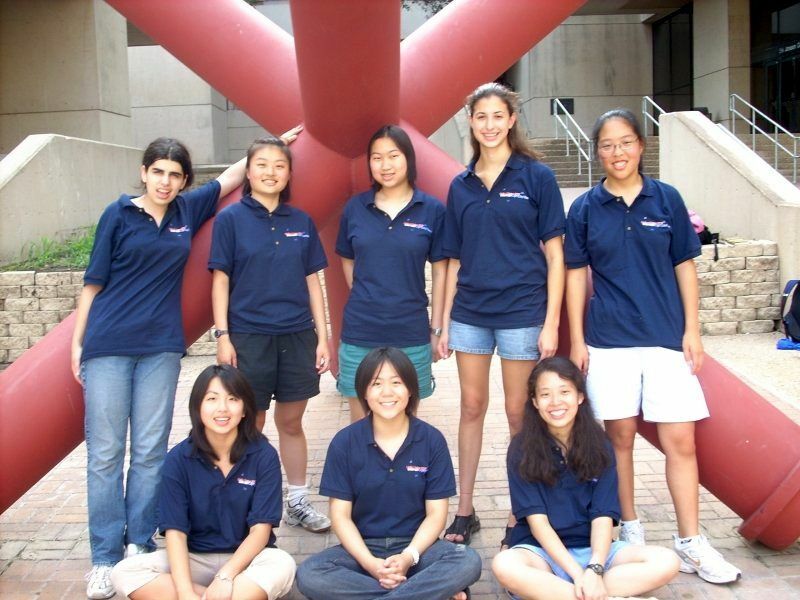 MSRI is delighted to be sending eight of the brightest young women in mathematics to participate in the 2007 China Girls Mathematical Olympiad. Founded in 2002, the Olympiad began as a regional competition for teams of female students from China and other eastern Asian countries (including Russia). China has now expanded this competition to countries from around the world, with the USA, Canada, South Africa, and Australia among the invitees. This will be the first time a team from the USA will compete in the China Girls Mathematical Olympiad. The team will spend three weeks preparing for the competition at the AwesomeMath program in Dallas. On August 6th they will travel to Wuhan, the capital of Hubei province in central China, where the competition will be held. We are very grateful to our very generous partners in this project, whose financial support has made the trip possible: IBM Almaden Research Center, Akamai Foundation, Mathematical Association of America, Shiing-Shen Chern Foundation for Mathematical Research, and Sunlin and Priscilla Chou Foundation. The members of the USA team are Marianna Mao, Wendy Mu, Colleen Lee and Patricia Li from the western US, and Sway Chen, Jennifer Iglesias, Wendy Hou, and Sherry Gong from the eastern US. The coaches traveling with them are Melanie Matchett Wood, Zuming Feng and Alison Miller. View the mathematical problems the girls worked on at the China Girls Math Olympiad. Monday, August 20, 2007 Colleen Lee: After five weeks the trip is finally over. All of us are aboard the plane on the 12-hour flight from Beijing to San Francisco, where, if time allows, we will meet with people from MSRI, one of our sponsors. We have all enjoyed these five weeks immensely, although a number of us are anxious to see our friends and family again. Many of us hope to return to AwesomeMath and the CGMO next year; in fact, some of us are willing to be mentors at AMSP if it means we will be able to return and enjoy our time there again next year. Zuming has mentioned a series of examples and exercises for MOPpers that he will give to this year's CGMO team. Success in the series may give some of us a second chance if we do badly on the AIME/USAMO next year, and many of us are eager to take the opportunity and to prepare to make next year even better. I'm going to miss everyone I've gotten to know in these past five weeks, although I will do my best to keep in touch with my fellow team members, our leaders, and the friends I made at AwesomeMath. With luck (and hard work, of course), I will be back next year. Jenny Iglesias: It's all over. We are on the plane ride now. It's been an awesome 5 weeks and I'm sad it's over. I made 7 amazing friends that I hope to keep in touch with once we all get home. Awesomemath was great. I learned a lot, had a lot of fun and had memories that will last a lifetime. Everyone there was interesting, and all the mentors and professors were extremely helpful (especially Alison). The trip to China was great. It was my first time out of the country. I got to walk on the Great Wall and learn a bit of Chinese. The competition was harder than expected but fun nonetheless and even though we didn't win, we got second in the Aerobics competition. My only complaints of this whole trip (Texas and China) are the stares and the stairs. Stares because I was the only white girl beside the Russians. Stairs because everything worth seeing is a glorified staircase. I hope that I can return to Awesomemath and CGMO next year. This has been one of the best times of my life. Sway Chen: It's hard to believe that our 5-week journey is finally over. It alternately feels like it's been a lifetime and an instant, and though I want to go home, I know I will miss all my awesome new friends and the times we had together. AwesomeMath was a lot of fun, and I learned a lot and met many crazy but awesome and funny people. Living and traveling with the CGMO team in China has made us all much closer with each other, and I'll definitely keep in touch with everyone. I am grateful for this opportunity to go to China and compete with students from around the world, and I would love to do this again next year. Sherry Gong: Alas! It is the end of our trip to China for the Girls math olympiad. Although the journey itself is over, however, it has left on each of us something eternal. Who, after all, could deny the effects of weeks spent doing what we love with a group of people who share our interests, our hopes, and our fears? For our team, at least, this olympiad presented a splendid opportunity for growth, both intellectual and emotional. Because I have graduated high school and will be entering college, this olympiad was my last, but I wish my teammates the best of luck and hope that you all enjoy a happy return next year. In addition, I would like to thank everyone who made this trip possible for us. This has been an absolutely incredible experience, and I'm grateful to everyone for everything at AwesomeMath and in China. So many people have inspired me in so many ways, and the time spent with each of my classmates, team-mates, and friends will be forever. I will study hard this next year, and the math will hold fond memories of the team members. When I play DDR, I will remember friends and mentors that inspired me to become better than my current self. To all the team except Sherry: I (desperately) hope to see each of you at AwesomeMath next year. To the people at AwesomeMath: I (desperately) hope to see you next year. To Sherry and everyone who graduated: I (desperately) hope to see you guys sometime. To our sponsors: thank you for everything! This trip has changed my life and given a new meaning to ambition. I will never forget any of you. Peace to everyone! I can't go back to where I used to be"
I guess it's not entirely accurate, but the trip has definitely changed all of us. I've learned so many things on this trip, both on a personal and academic level. And, unfortunately, even if we still stay in touch, I know I will always miss the intense closeness I shared during our journey. Alright, so those lyrics aren't too accurate either, I wouldn't call anyone on the team my 'fire' (except maybe Patricia). I guess what I mean is, when there are thousands of miles separating us, I will still treasure our friendship & our fun times. Dear Sponsors: thank you so much for giving us the amazing opportunity. I have grown so much and had an incredibly fun & challenging summer. CGMO girls: I love you and KIT. Looking at the old entries in this book, it's difficult to believe that they were written five weeks ago, three weeks ago, whatever. They don't seem that long ago. Anyhow, I had a great time at AwesomeMath and in China, and, I'll try not to forget the people I've met. To all our sponsors, thank you for giving us this wonderful experience. I've learned a lot (mathwise and otherwise) and I've had many experiences I would not have otherwise had. To everyone on the team and our team leaders: Thanks for making the past five weeks so memorable. I have gotten closer than I could have ever imagined to you. It's been real. You have helped make lifelong memories for me. Hopefully I'll come again in the future. If I do, I'll be prepared for another incredible five weeks. Monday, August 20, 2007 Here are some more photos, taken by photographer George Csicsery and through the courtesy of the Mathematical Association of America, of the arrival of the U.S. Girls Team that represented the Western states at San Francisco International Airport on Monday, Aug. 20th. Sunday, August 19, 2007 This was the trip's designated "shopping day", where we all went to the market and department store across the street from the Holiday Inn at which we were staying. The thing about shopping in China is that you can haggle, which requires a certain degree of competence in the Chinese language. I'm sure that at the beginning of the day we all got ripped off at some time or another (or in my case, all through the day). However, near the end of the day, Sway and Marianna got very good at bargaining. They'd go around together, spot something they liked, and make the price go lower, one of them saying "that's ridiculous!" (in Chinese) and the other insulting the merchandise and saying how it wasn't even name brand. Then, they'd pretend to walk away and the vendor would call them back and name a lower price. In the evening, most of the team went to some Mongolian restaurant for dinner. Apparently they had the most amazing meats such as camel and donkey and almost pigeon. It's hard to believe that we're going home soon, although I'm looking forward to it very much. Saturday, August 18, 2007 Today we visited the city wall of Xi'an, where we rode bikes around the city on top of the wall. From the wall, we could enjoy a view of both the inside and the outside of the city. After our tour to the city wall, we went to the airport for our flight to Beijing. In Beijing, we saw the Beijing acrobatics show. The show's amazing combination of ancient and modern talent amazed all of us. At one point, for example, the show featured eleven intricately dressed acrobats all riding on a single, one person bicycle. Equally intriguing was the precision of the flying jumps that the child acrobats performed. Overall, most of us found the show simply awesome. After the show, we went back to the hotel for some rest. Friday, August 17, 2007 Today we went on a tour of Xi'an. First we went to see some sites from the ancient capital, like the springs where the emperor bathed. We then rode a cable car up a mountain which we climbed on foot to a watch tower on the peak. On the way down Marianna, Wendy Hou, and I also decided to jump across a valley while suspended from a set of cables. It was an exciting thrill ride. In the afternoon we went to see the terra cotta soldiers, the main attraction of Xi'an. The soldiers were partially excavated from the pits they were buried in, so all we could do was walk around the pits and look at the soldiers from a distance. For dinner we went to a dumpling restaurant, where we had all kinds of dumplings in various fun shapes. Some of them were almost too cute to eat, like dumplings shaped like goldfish. At the end of the day we all received a gift from the travel agency, a miniature terra cotta soldier. Thursday, August 16, 2007 Today was the last day of the competition. We got up earlier than usual to get to the closing ceremony. The ceremony started with a short speech, and then without fanfare, the winners of the competition were announced. Sherry got first place with 114/120 points and a Russian girl (who placed 3rd at IMO) was several points behind. Wendy Hou got a silver medal and Patricia, Wendy Mu, and I got bronze. After taking team photos, we headed to the airport, where we took an hourlong flight to Xi'an, the city of the terra cotta warriors. We took a tour around a Xi'an park with huge engraved stones of Chinese history. Finally we headed to our hotel and had a dinner. Congratulatins to everyone who all did a great job. Thursday, August 16, 2007 We took the plane to Xi'an today after the closing ceremony this morning, and are all doing well here. The team did well on the competition, and we're proud of them :-) in particular, Sherry Gong got a gold medal, tied for first place at the competition, Wendy Hou got a silver medal, and Patricia Li, Marianna Mao, and Wendy Mu all won bronze medals. Thursday, August 16, 2007 Girls Math Olympiad problems. Wednesday, August 15, 2007 This morning, we left for a tour around Wuhan and we stopped at a park place. There was a lake, and by the lake, there was a shack with water bubbles. The person stands inside a large, plastic, air-filled, airtight bubble, and jumps into the lake and tries to balance. Inevitably, he fails to balance, and the bubble rolls sluggishly over, toppling the person inside with a resounding splash. Jenny and Marianna and I each spent around 10 minutes floundering inside plastic bubbles, laughing hysterically. We will post pictures soon. Quagga for the win! Tuesday, August 14, 2007 In Beijing, we did a lot of tourism and stayed at the Holiday Inn Beijing. We went to the Great Wall, where we did some serious climbing. We went to Tianamen Square and the Forbidden City, and climbed up a hill near the Forbidden City from which we got a great view of Beijing. We went to the Summer Palace and the Temple of Heaven. We enjoyed many excellent Chinese meals (as you see in a couple of the pictures), including Beijing duck, dumplings, and many traditional meals. As a group, we have a few favorite dishes, including fried balls of sweet potatoes. We had a nice bus that took us around Beijing, and a guide Ms. Chen who led us and helped us get good prices for everything! We headed on an overnight train to Wuhan, rather exhausted from our days of tourism. We enjoyed the overnight train ride. In Wuhan, the students are staying in a dormitory in a school where the exam in being held, and the leaders are staying at a nearby hotel. The two days in Wuhan were mostly a chance to rest and attend the opening ceremony (see pictures). On August 13th and 14th, the students took a four hour exam each day (see picture of the exam room). As I write this, they are in the second day of their exams. In the afternoon, they have taught all the students a dance (see pictures), and this afternoon there will be a dance competition. Tuesday, August 14, 2007 Today was the second day of the contest. The four hours today seemed to fly by as well, or at least for me. We're all curious about our scores, but we will have to wait for a couple of days for that. After lunch was the aerobics competition in the auditorium; we had to perform the dance we were taught in the aerobics lessons the previous two afternoons. We were part of the 10th group to perform, and we did pretty well; we ended up winning a second prize. Other than that, we all have mostly just been hanging out together and having fun. Monday, August 13, 2007 We have been getting ready for 4 weeks for this day. The announcement system woke us at 6:30 am. We went to breakfast and then went straight to the classroom for the contest. You would think 4 hours is plenty of time; but those 4 hours flew by. Today didn't seem to go that well; hopefully tomorrow will be better. After the contest, we had lunch and headed to aerobics. The dance that made no sense yesterday came together today. Wendy is one of the best here, while the rest of us are just happy to remember all the moves. After dinner we continued to work on learning the dance. That's about it for today. Sunday, August 12, 2007 We had our first breakfast at the cafeteria today. It appeared that the place was unprepared or at least not equipped to serve so many people, since lunch trays ran short. Students that arrived later were given food in metal bowls or plastic bags instead. On the food side, there seems to be a lot of oil involved. Most of the food was quite greasy, although it still tasted good. After breakfast, the students competing in the CGMO met in the classrooms to prepare for the opening ceremonies. All eight of the girls on the U.S. team wore their light blue polos for the occasion. After a short walk, we sat to listen to the various speeches. While the opening remarks (which were in Mandarin, of course) were translated into English, the guest speakers' words were not, which made the experience a bit dull for those who could not understand the language spoken. Fortunately there was a PowerPoint (in English) that presumably listed the main points of the speeches. This was followed by group photos. After lunch, most of the team went to the dance/aerobics activity. The speed at which the Chinese students were able to pick up the moves specified by the instructor surprised many of us, but we realized that such an activity might be part of the regular school day for the students in China. We were instructed to proceed immediately to the dining hall after aerobics, although dinner did not start for half an hour. When dinner began, however, since the vast majority of the students were waiting just outside the doors, the food area was extremely crowded, and the lines moved very slowly. In part this was also because some students found it more effective to move backwards down the food line, delaying those that were moving forward. After dinner, there was a supposedly mandatory study session in the classrooms. However, we decided to remain back in our dorms to do things there instead. Throughout the day, we visited a store near the dormitories to stock up on food (snacks, more or less), drinks, and for some of us, batteries. We also noted that the supply of CDs for sale in the store included a good amount of American pop music alongside Chinese titles and CDs of western classical music. The test portion of the competition begins tomorrow. I hope we do well! Saturday, August 11, 2007 At seven o' clock this morning, the train conductor woke us up and told us to get ready for the arrival. We got our luggage and walked out of the station, which involved walking up and down several flights of stairs while lugging our luggage with us. We then met the people from the Girls Math Olympiad, who directed us about a mile to a bus stop, where we dropped off our luggage and went to a small restaurant for breakfast. Some of the other teams were there, but we didn't really talk with them. After breakfast we returned to the bus, which took us to the university where we'll be staying. We got checked in and went to the dorms. They aren't the best. The beds are wooden planks with a wimpy pallet on them, and they have mosquito netting around them. The shower and the toilet (which is just a paved hole in the ground) are in the same room, and the shower only has cold water. At 12:10 we headed off to lunch, where we got the chance to meet other teams. The food wasn't bad. Afterwards we went back to the dorms, where we cleaned up, studied, or just hung out. At 5:30 we had dinner, which was again not bad, except a bit spicy. Then, at 7:00, we went to the classrooms (where we'll be taking the test) to go over the schedule for the next few days. Friday, August 10, 2007 Today we continued touring throughout the day, after checking out of the Holiday Inn. We went to the Summer Palace in the morning, where we took a boat ride across a lake and climbed up a hill to see a Buddha. For lunch we had noodles, and then went to the Temple of Heaven. We had dinner at a Shanghai-style restaurant, and then headed off to the train station. After waiting for about half an hour, we got on the train, and found our rooms. There are 4 bunks in each compartment, so between the 8 of us, Alison, and Melanie we have 3 compartments. We are taking the overnight train to Wuhan, so we will arrive tomorrow morning. Thursday, August 9, 2007 Today, we visited Tian-an Men, and Gu gong, and then we took a walk up Jingshan. Because it was hot and sunny outside, the level of excitement for sightseeing progressively fell during the trip, but overall we had a good time. After going up the Great Wall yesterday, some of the girls had little interest in climbing Jingshan, but it turned out to be fairly easy. Then, after having lunch at a Peking Duck place, we went back to our hotel. Some of us went to the market. Most of us are resting in the hotel now. Tuesday, August 7, 2007 I've gotten behind on writing since the hectic last days and endless plane flights. We've spent since Saturday taking last tests, packing, and (optional) crying as we left our home of three weeks. Then, the endless flight delays, which almost made us miss the flight to China. After an enormously long plane flight, we arrived in China, found Sherry, met up with Mr. Zuming, and went to the hotel. China is cool, but driving in China is terrifying. Today, we're going to go touring. We'll put up some pictures soon. Friday, August 3, 2007 In our morning class, we had a guest lecturer, Professor Zoran Sunic, who talked to us about coloring points on lines and in planes and proving things about them. Then in the problem session we saw how to prove inequalities using Schur's, Muirhead, and a lot of algebra. In the afternoon, we did more problems involving projective geometry. After classes, most of us went back to the apartment and played card games. After dinner, a photographer from the San Francisco Chronicle came and took pictures while we worked on the homework we were given in Algebra. Then, at 8, Colleen, Wendy Hou, Patricia, and I went to the Karaoke that was scheduled in the Pub in the student union. Well, today was fun, but we have tests tomorrow... so hopefully we will all do well. Thursday, August 2, 2007 Today Oleg Mushkarov showed us part of Malfatti's problem. We started our problem session singing Rudolph the Red Nosed Reindeer, continued into the Star Spangled Banner, and ended with Backstreet Boys. During the lunch break, Track 3 mysteriously acquired all the dry erase markers. In the afternoon, Ivan taught us more projective geometry, including polar points and lines. Throughout the day most of the other girls tried to teach me some Chinese. I sort of fail at it, and spent most of the day saying cè suo (bathroom) improperly. Before dinner, we went to take pictures at Love Jack. We had lots of fun: photo 1 & photo 2. After dinner, most of us went to the forum on Barycentric coordinates, Which was awesome since Zabel taught it. I think that's all the interesting stuff for today. Wednesday, August 1, 2007 Our Algebraic inequalities class today involved learning about Jensen's inequality, which led to a discussion about the convexity and concavity of functions. It also showed a use of calculus; while we might have used it to bash maximum/minimum problems (which usually made things quite ugly), calculus could help with Jensen's. During the problem session, we learned about smoothing, a technique with which we could easily prove inequalities such as AM-GM. The afternoon lecture on Projective Geometry was quite interesting, like the day before. For one, it began with a demonstration with a flashlight and a smashed cup. Then, we learned a host of theorems, including Pascal's, Pappus's, and Brianchon's. In all, it proved to be yet another intriguing venture into a new side of geometry. Tuesday, July 31, 2007 In the morning was a class on the rearrangement inequality and Chebyshev, which follows from the rearrangement inequality. Like always, the lecture focused more on the basics and the problem session employed those ideas in harder problems. The afternoon class was more interesting (in my opinion). We were introduced to projective geometry, which was sort of confusing at first, but we quickly adjusted to it. Projective geometry can be used to prove points collinear or lines concurrent. After classes, Marianna, Wendy Mu, and I worked on problems in my room, while Jenny worked with some guys who came over. We were all somewhat productive. Monday, July 30, 2007 Today was our camp trip to Six Flags Over Texas, considered by many to be one of the highlights of AwesomeMath. Unfortunately, it started raining as soon as we reached the park, causing most of the rides to be shut down. We spent the first few hours there wandering around and waiting for the roller coasters to open once the skies cleared up. But after we sat under the sun for an hour in front of the Batman roller coaster, we gave up. Later in the day, however, once the storm clouds had passed (and it was unbelievably hot and humid) we went on exciting roller coasters like the Texas Giant, Mr. Freeze, Runaway Mountain, Batman, and Flashback. The biggest roller coaster in the park, the Titan, remained closed "due to inclement weather" but we had fun anyway. Sunday, July 29, 2007 Marianna Mao decided to do her blog entry for Sunday as a photo post. Saturday, July 28, 2007 In the morning, we prepared to take the tests. I decided that if I did well, I would play DDR to celebrate, and if I did poorly, I would play DDR to cheer up. In class, we posted solutions to the 5x5 grid problem, but this took half an hour, and we hardly had time to do the test afterwards. I've finally learned how to avoid the DDR crowd around mealtimes by playing before eating. At dinner, there were popsicles, but they kind of melted, so I ate popsicle slush out of a cup with a spoon. Then the counselor Mr. Garrett let Colleen and me play with StepMania on his laptop. Although we had a generally cheerful day, many of us are dreading the results of today's doom-tests. May the graders have leniency on us! Friday, July 27, 2007 Today's breakfast was interesting because all seven of us ate together -- usually some of us go to breakfast earlier while others choose to sleep for a little while longer. In our morning inequalities class, we worked on various inequalities again. During the problem session, we proved more inequalities, including Chebyshev. Then in the afternoon geometry class we learned about geometric transformations and their applications including geometric extremum. During the problem session afterwards we were given an interesting problem / challenge: the five people who go to class today with the shortest paths connecting points in a 5x5 grid such that one can go from any point to any other point, will win candy. After dinner, most of us hung out at our apartment, studied for tomorrow's tests, and played games such as chess. Thursday, July 26, 2007 This morning we spent mainly working on problems both in the problem session and in lectures. We have started to solve IMO problems regularly. Marianna took a couple pictures in class. In the afternoon, we learned more about geometric extremes in the lecture and learned a neat proof using barycentric coordinates in the problem session. This afternoon's problem session had more chickens than ever before. After afternoon classes we played ping-pong and DDR in the UTD student union. We ate dinner and then studied and did homework for a couple hours. We then relaxed, playing card games and chess. Wednesday, July 25, 2007 Although we thought we had a guest speaker in our morning Algebra class, it turned out we didn't. Instead, Josh taught us again, with his method of using many problems to teach us inequalities, especially Schur's inequality. This was followed by a problem session, in which we learned about the "Rearrangement Inequality" and went through various problems. In the afternoon Geometry class, we had 2-time IMO medalist and WOOT director Naoki Sato as our guest speaker. Much of the class was review of the previous material, but it helped to reinforce points that were not fully grasped the week before. At 6:30 PM, the first day of the chess tournament took place. Those of us who had signed up headed to the hall known as the Galaxy Room to compete. Congrats to Wendy Hou, who won both of her matches today! Tuesday, July 24, 2007 Class started again today. In the morning was a lecture on Cauchy-Schwarz (actually, more like a problem session) with Josh, followed by the actual problem session. The afternoon classes were supposed to be geometry but ended up being more algebra. The teacher's explanation for this was that he liked algebra more, so he lectured on geometric inequalities. That was okay, but what I didn't like was that the lecture was fairly basic and the problems were barely doable (at least for me). After dinner was a mandatory "chess talk," which just turned out to be a fellow from the UTD chess program trying to recruit people for chess. He kept mentioning how if we had a high GPA and SAT scores, we should come and play chess for the school. In any case, we're going to be lectured by a guest lecturer tomorrow. That should be interesting. Sunday, July 22, 2007 Yesterday was a free day. We all got up late, headed to breakfast/lunch (CHIPOTLE -- yum!! ), and lounged around. We discovered that Sway is an exceptional DDR player. Afterwards, we headed back to the dorm, where we played card games or read Harry Potter. In the afternoon, some of us went on the scavenger hunt (and got caught in a thunderstorm). Dinner was a barbeque by the pool. At 8:00 there was an ARML-style team contest. All in all, we basically just lounged around the whole day. It was a pretty good break from math. Saturday, July 21, 2007 We had tests today, which was probably a good idea because everyone's trying to read the new Harry Potter book. The tests were hard, but not completely impossible. That makes Sunday a free day, so we're probably going to stay up late reading. I heard the library is going to be open for the next week, so hopefully, we'll be able to use it. There were popsicles with dinner, which was really nice, since Texas is so hot during the day. So after dinner we returned to the dorms, and tried (and failed) to juggle while apprehensively discussing the tests. I hope we get results back soon! Friday, July 20, 2007 Everyone is definitely adjusting to the schedule here. (Actually, we still have classes tomorrow but not on Monday.) In today's morning algebraic inequalities class, we learned about linear and quadratic functions and used them to prove linear and quadratic inequalities. In the afternoon geometry class we did locus problems, proved geometric inequalities, and learned more interesting facts about the triangle. Outside of class, all of us just hung out some more. A few of us got to test our skills on the DDR machine in the student union. Later after dinner, most of us hung out in our apartment, talked, and played games like SET and poker (not with real money, though!). We then worked on some of the problems we were given earlier. Hopefully tomorrow's classes will be as interesting as today's. I'm definitely looking forward to the next few days; hopefully they will be fun. Thursday, July 19, 2007 We've finally gotten used to the schedule. (We aren't falling asleep in Geometry.) Today's classes were easier. AM-GM in algebraic inequalities and symmedians in geometry. We got our first number theory problems last night and worked on them throughout the day. After classes we played SET, took pictures of each other, and talked about toads. We are all really close now even though it has only been three days. After SET, some of us went to the forum (which wasn't that great) while the rest of us stayed back and worked on problems. Wednesday, July 18, 2007 As with the day before, we attended breakfast (which led to sitting in the hallway outside for the lack of seats in the dining hall) which featured burritos today. In our morning class, we covered a technique commonly used in math contests: induction. Though it is a simple technique we quickly found how it, in conjunction with other things we had learned, could solve complicated problems. The afternoon session involved learning about the many "special points" of a triangle. We were also introduced to the 9-point circle, or, as one of the assistants called it, a 9-point potato. Hand drawings tend to be imperfect. More scheduling kinks were worked out today, as students began to accustom themselves to the schedule. Dinner was now scheduled at 6 PM instead of the 5:15 PM of the day before. Afterwards, the team members continued to get to know each other in their attempts at studying as well as over a few card games. I'm curious to see what will come up over the next few days. Tuesday, July 17, 2007 Clases started today. In the morning was a lecture on inequalities, where we learned how to apply x2 >= 0 and basic inequalities, like the RMS-AM-GM-HM inequality chain. Afterwards we had a problem session led by two (slightly) older students from Exeter. After lunch was the geometry class, where we were lectured on some pretty awesome things, such as vectors and how to add them, facts that the teacher derived from Stewart's theorem, and some trigonometry. Again, after the lecture was a 90-minute problem session led by two assistants. One of the highlights of my day occured when Benjamin, another student in the class, drew a rather poor circle, and one of the assistants commented "...and you have a potato which is tangent to all four sides." After dinner (salad and pasta) the team headed back to the apartments, where a study group quickly formed. Pretty soon, all the students were crammed into me [Patricia] and Jenny's room, working on the problems we received today. When all of us were ready for a break, we played around together and hung out with each other. I must say that this casual socialization let us get to know each other better than the meeting yesterday did. In any case, I can barely wait until tomorrow. I am excited to see what we'll do, in class and out of it. Monday, July 16, 2007 We arrived in Dallas, Texas for AwesomeMath today, and we will be training here for 3 weeks before heading off to China. Here's to living out of a suitcase indefinitely (5 weeks but that's still pretty close). So Texas isn't exactly what I expected it to be. I had this mental image of Texas being a desert with buttes and mesas in the horizon, and maybe some random oil rigs popping out of nowhere. (Western movies are not geologically accurate, it seems.) There are a surprising number of trees / blades of grass. And no mesas or oil rigs or deserts as far as I can tell. But it is still really hot, as I can tell from stepping out of the airport. However, Texas does boast a high concentration of pickup trucks, cowboy hats, cowboy boots, plaid shirts, highways named after George Bush, and Chili's restaurants. (I think I saw 4 of them on the shuttle ride from the apartment to Waterview Park.) Maybe some stereotypes are true after all. AwesomeMath has been good so far. We moved into the Waterview Park apartments, which are nice and clean. They're like regular houses, not college dorms, so they have full bathrooms, kitchens, and bedrooms without the matching dressers and desks. And the living room has a big squishy couch. The student union is pretty awesome; it's got ping pong and pool tables, and an arcade with DDR. I haven't exactly figured out the classes and dining situation yet, because we haven't gotten there. Hopefully it'll be set today, because I'm getting hungry and I want to start doing math. The people here are cool. I'm in an apartment with Wendy Hou (wobster109), Maesen, Valerie, Claudia, and our mentor Ioana. The other 5 members of the Girls' Math Olympiad team (Patricia, Jenny, Marianna, Wendy (Mu) and Colleen and their mentor Alison) are across the hall from us. We had our first team meeting last night after curfew, so I got to meet everyone. We're going to be in the same class (algebra and geometry) while we're here. I think that's all for now, so tune in next Monday for my next update. Now I have to go find Patricia so she can do Tuesday. Monday, July 16, 2007 Hello from Dallas! It's quite hot here (highs above 90) but fortunately the dorms are air-conditioned. Everyone arrived by plane Monday morning, and we're moving into the apartments, which are fairly spacious if a bit sparsely furnished... They couldn't put everyone in the same room because of fire code restrictions, so Colleen, Jennifer, Marianna, Patricia, and Wendy M. are living with me, and Sway and Wendy H. are across the hall, in a room with the mentor Ioana Lazar, a Romanian graduate student. Classes started on Tuesday: the girls are taking Algebraic Inequalities from Oleg Muskhariv and Geometry from Mircea Becheanu. When they aren't studying, they've been running, swimming, and playing cards. I've attached a picture of the girls in our apartment. From left to right: Colleen Lee, Marianna Mao, Wendy Mu, Wendy Hou, Sway Chen, Patricia Li, Jennifer Iglesias (the girls thought it would be cool to arrange themselves by height).